The two-alarm fire was still under investigation. A fire in an Everett building early Sunday left one person dead and heavily damaged apartments on the second floor. 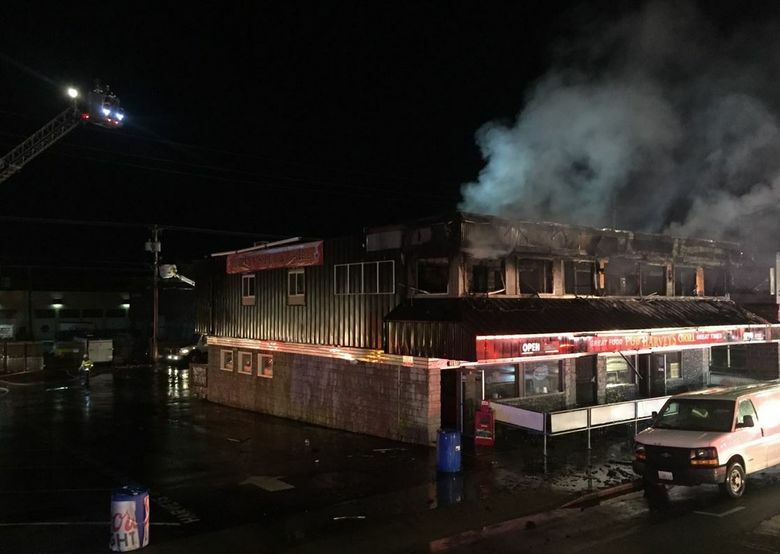 The Everett Fire Department responded at 12:36 a.m. to Harvey’s Pub at 3615 Broadway after reports of flames coming through the roof of the two-story building, said Steve Goforth, Everett Fire assistant fire marshal. Working smoke detectors alerted people in the upstairs apartments — Goforth said there were three units — and in the bar on the ground floor, who evacuated the building. The fire was quickly upgraded to a second alarm, and firefighters from the Navy and South Snohomish County Fire and Rescue joined Everett Fire units responding. Firefighters took defensive positions and knocked down the fire. They performed a primary search of the first and second floors, but were unable to immediately search a portion of the second floor due to dangerous fire conditions, Goforth said. That’s where the victim, believed to be a male, was later found, Goforth said. No other details about the victim were available. Investigators were still processing the scene at midmorning Sunday, Goforth said.